While Detroit has seen positive changes in the police department and the inclusion of African Americans in civic life since 1967, the decline of manufacturing and flight of people over the past five decades have contributed to significantly higher levels of unemployment and impoverished residents in the city. Reynolds Farley, a retired University of Michigan sociologist, notes that in 1950, Detroit had the nation's "most prosperous black population." But the city's black community is now one of the nation’s poorest, with much of the blame placed on decades of job loss, especially in auto and government jobs, and the migration of middle-class white and African Americans to the suburbs, where jobs are more plentiful. Below, some jarring numbers showing how far black Detroiters have economically regressed since the troubles of 1967. In 1967, housing conditions for black Detroiters were substandard to those of white Detroiters. But home ownership for black Detroiters in the late 1960s and early 1970s was higher than for any black community in the United States even though 120,000 black Detroiters still lived in slum conditions during the riot era. Five decades later, as Detroit became much poorer, the percentage of residents owning homes has dropped, especially among whites. The foreclosure crisis after 2005 hit both white and black Detroiters hard, and cost taxpayers millions. The Detroit News reported last year that there have been 65,000 mortgage foreclosures in the city since 2005. Of those, 36,400 homes (56 percent) were blighted or abandoned, with some 13,000 slated for demolition, at a cost of $195 million. Just after the riot, when black Detroiters’ income was three-quarters of white income, the black community in Detroit was one of the most prosperous in the nation. Today, though, black income in Detroit has slipped to a little more than half of white income, as African American elsewhere have made gains. According to the Pew Research Center, since the 1960s, household-income growth for African-Americans has outpaced that of whites. Median adjusted household income for blacks is now 59.2% that of whites, up slightly from 55.3% in 1967 (though in dollar terms the gap has widened). 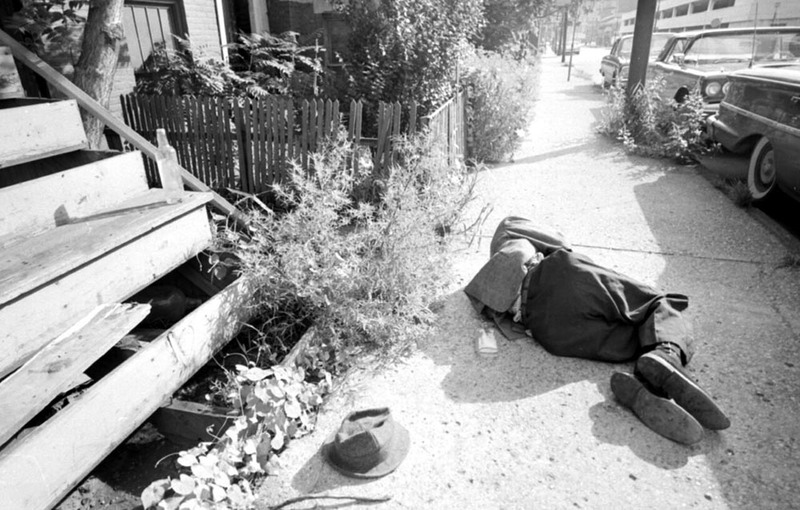 By 1967, poverty was the focus of “wars” at both the federal and local levels. President Lyndon Johnson convinced Congress to pass extensive anti-poverty legislation in 1964 and 1965. Even before the federal government stepped in, Detroit Mayor Jerry Cavanagh, who took office in 1962, became one of the first big-city bosses to enact programs to help poor residents, including medical and dental services, job banks and work training. After the riot, though, critics raised questions about the effectiveness of Cavanagh’s anti-poverty efforts. Aggressive government action to help the poor faded over the decades, and Detroit continued to lose jobs at a steady rate. For many years, Detroit has been one of the nation’s poorest big cities. By 2016, the city had received international attention for its large number of home foreclosures and water shutoffs, and a study this year published in The Journal of the American Medical Association showed life expectancies for Detroiters – 77.7 years -- ranked among the shortest for residents of U.S. cities. The flight of industry from Detroit began after World War II, and the city lost 165,000 jobs between 1955 and 1963. But for a few years before 1967 the local economy boomed, and Mayor Jerome Cavanagh’s manpower programs helped keep the unemployment rate low. Joblessness, though, was growing again by the time of the civil disturbance in 1967. The city’s 6.2 unemployment rate then was the highest it had been in five years, according to historian Sidney Fine. Unemployment in the riot areas was about twice the overall city rate, and among youths ages 18 to 24 the rate was estimated to be between 25 and 30 percent. In academic studies of the disturbance, experts found a strong correlation between self-identified rioters and unemployment, especially for rioters who had been out of work for a long time. By 2016, five more decades of deindustrialization had taken its toll, especially on black Detroiters. High-tech jobs have grown, but there has been no major job creation for the low-educated. In April of this year, city unemployment stood at 9.1 percent, far higher than 1967, but a dramatic improvement for the decade. In 2009, city unemployment exceeded 25 percent and just two years ago stood at 16.3 percent. But the black/white disparity remains. In 2014, the most recent year available for racial comparisons, 4.9 percent of white men in Detroit were unemployed, compared with 14.4 of black men. White women unemployment was at 5.3 percent, black women at 11.9 percent. Sources: U.S. Bureau of Labor Statistics; U.S. Census; "Violence in the Model City," by Sidney Fine; "Divided Detroit," Reynolds Farley, Sheldon Danziger and Harry J. Holzer; New York Times; Detroit Free Press. Drawing any equivalence between Young and Patterson is utterly simplistic and totally wrong to both men. No one ever mentions that the Democrat party wanted to eliminate the manufacturing industry simply because it was "dirty". Now we see the results of another "progressive liberal" policy. This policy has single handedly put millions out of work with no future. So just when do we understand that nothing will work in the economy until manufacturing is released to create jobs again. Get rid of the regulations that strangle the industry and start growing the economy again. It's just that simple. I really doubt the Dem party platforms of years past included eliminating manufacturing industries - but I didn't look it up. They may had policies that required manufacturers to clean up whatever pollution they caused which may have led companies to go out of business because they couldn't pay the costs and stay in business. If that's the case, then perhaps it's a philosophical difference. Do we socialize the risks and privatize the benefits? I think I'm simplifying a complex issue though. You can blame part of the manufacturing exit to the UAW unions greed. Had those unions focused on leg image poor management issues, instead of more pay and benefits, there would still be significant manufacturing in the state of Michigan and Detroit. What is sad however, is the various communities seem to have given up trying to help themselves. Education is horrible as the number of graduates is less than 50 percent and that will never get those kids jobs. I wonder what the statistics are with regard to marriage stability and number of kids there are in each household? And, when you drive through the neighborhoods, it is frankly disgusting as it seems people don't care about the looks of their neighborhood. Leadership is simply lacking, as are Christian values it seems. Crime statistics are off the map, and who wants to visit, or live in a city where they don't feel safe? We wish the best for Detroit, Flint, etc., but it will take hard work by everyone. Yes, there was a push in the late 70's and early 80's to get rid of "dirty" industries across the country, before the regulations to clean up contamination. Detroit was "clean" manufacturing jobs. I think the real possibility of a Chrysler bankruptcy at that time kind of toned down this idea as the reality of nearly 500,000 people, the majority in Detroit was within a week of happening. I don't know if this was an attempt by Detroit to get rid of the "dirty" businesses, but manufacturers tax rates had risen to 50 mils at this time also. It is worse today. The difference is there are fewer whites who would run to he suburbs. The downtown area would be affected the most. Fix the schools. Poverty is a vicious circle. But it can be broken if one wants to. The man who walked twenty something miles a day to get to work and never missed a day. Dr. Ben Carson who is an esteemed surgeon. Dennis Archer who served both on the Michigan Supreme Court, and as mayor of Detroit. Many, many others who would not settle for illiteracy or a life of crime. Yes, the jobs have changed in the past 45 years but some still are able to get away from the vicious circle. And all these above stats, we've spent how many billions of dollars? And from the Neo-Marxist Progresssives we hear it wasn't enough and we need to spend even more to do the very same things and even more drastic and drestructive. Is it necessary to use names to respond? I believe the information or misinformation adds significantly to the strong emotional perception of economic, social, class or racial gaps either real or not are seen as greater than 67. Great article! Technology and global competition have eliminated a significant number of lower skilled jobs. Combined with the never ending growth in Government, regulation, taxes, corruption, and lack of personal accountability. In addition, excessive debt levels, and monetary manipulation will always lead to the poor falling farther behind. Time to rethink the current social agenda and get back to free market principles and work together as a community. One of the key contributing factors most often never discussed is the poor choices people make. For the past 5 decades ~80% of Black babies in Detroit are born to unwed mothers with the vast majority of them already in poverty. There is a difference between poverty and generational poverty. We are seeing the results of generational poverty becoming comfortable poverty. I believe there isn't an educational model anywhere in the US that can successfully educate a student population that is primarily from generational poverty. We have to change the culture and mindset of comfortable poverty, of education as a low priority, of having children when one cannot afford it. Need to get back to the basics or nothing will ever change, it will only get worse. We already have half of Americans not paying any Federal Income Tax. We are headed down a very slippery and wrong path for America. Mr. McGraw might want to consider that when reporting on events 50 years ago that a reporter becomes an historian and has a responsibility to do research like a historian and tell about the events in the context of the broader history of that time, and even geography. What if the context of the times was as the US had moved from an agrarian economy to an industrialized economy, in the 50s and 60s the US was moving from a leveraged 'strength' based economy to a leveraged 'knowledge and skills' based economy and into the 70s the US was moving from a manufacturing based economy to a service based economy. Could it be that post 1967 Detroit’s shift was to dependence on centralized government institutions/agencies/politicians and away from integration into the broader economy? What if the events on 12th Street were simply a hot night in Detroit, people were outside socializing while trying to stay cool [with cold beverage or two in hand] and the raid on a 'blind pig' was simply entertainment until one or two or a few decided to become part of the entertainment? What if that week in Detroit were nothing more than people [from outside Detroit and inside] with little regard for others simply converging to take advantage of a lawlessness that took hold after that Sunday morning? What if that week in 1967 were simply what the politicians used in taking advantage of a local ‘crisis’ gaining media attention and support, and creating an opportunity to establish political careers? What if the rationale Mr. McGraw alludes to became a cover for political balkanizing of Detroit for political power? What if that balkanization of Detroit became a barrier to assimilation that previous ethnic groups had used to build their economic futures? If we look at that summer of 1967 not as a symptom of a new and severe social problem, but as a political excuse that separated from the rest of the economy would that change how we addressed the current situation? Duane: What if you took a more objective look at the history of post W.W.II Detroit and then bothered to glance at what was going on in other industrialized mid-western cities with maybe a little peek at cities on the East Coast as well as the West Coast, many of whom also had riots. Ann, You could be right, more specifically what do you believe I am missing? "If the people won't come, nobody's going to stop them"